For a very long time, I have loved swimming, despite not being an especially good or graceful swimmer. I just like it, plain and simple. I like how I feel weightless, almost like flying. I like how my body feels afterwords, both tired and relaxed at the same time. I like how it’s the only place where my million-thoughts-a-minute brain is not thinking or worrying about anything other than staying afloat and not hitting the person next to me. It’s as close to meditation as I’ll probably ever come. Swimming, for me at this age, comes with lots of barriers. When it comes to excuses, I am an Olympic athlete. I could write a whole post dedicated to my excuses, but instead I’ll just say this: ugly and unflattering Speedo bathing suit, expensive hair + chlorine = green hair, extra large head stuffed in a swim cap, painful goggles, looking like a fat, clumsy fool in public, and, uh, personal grooming. You want more? Oh, I’ve got more. Recently I cast all my excuses aside and jumped back in the pool after a twenty year hiatus. All of those silly things that mattered so much to me mean nothing once I’m in the pool. It has truly been one of the best things I have done for myself, and my only regret is that I didn’t start sooner. I can never eat too much before a workout, but watch out after! Today I made a very unwise food choice for my post-swimming meal, so I decided to concoct something healthy and filling for tomorrow’s breakfast: a green smoothie! I have been on and off the smoothie train over the years, and I feel like the time is right to introduce them back into my world. Who knows what other good things will follow? In the meantime, I will just keep swimming, swimming, swimming. Combine all in blender until smooth. Add milk to thin it out if desired. 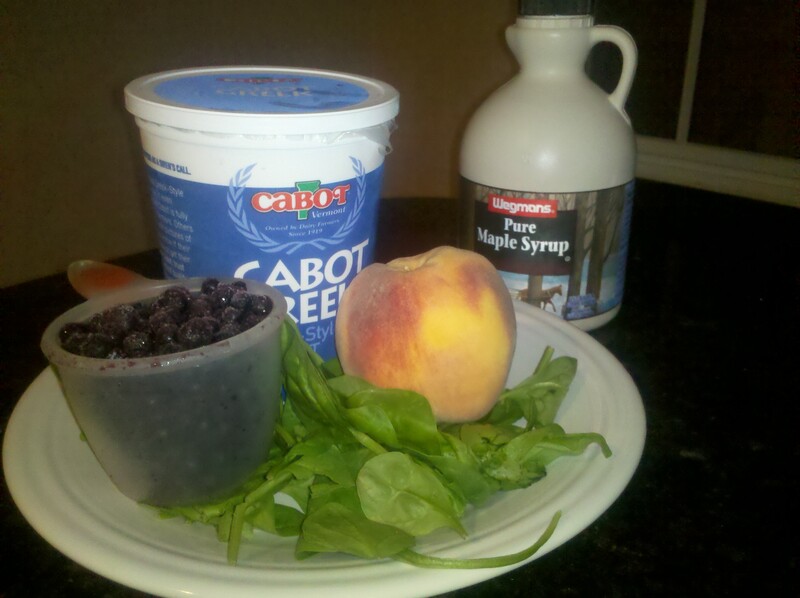 This entry was posted in Beverage, Uncategorized and tagged blueberry, peach, smoothy, yogurt by Mom Mom's Apron. Bookmark the permalink.